The Tap Takeover Podcast crew hits the road for a special beer release Saturday. 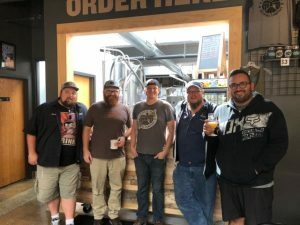 First up, we sit down with Max from Eagle Park Brewing in Milwaukee to discuss the release of their Nelson Sauvin New England-style IPA, as well as some other upcoming releases. Then we travel to contract-brewers Octopi Brewing in Waunakee, WI to check out the release of the Untitled Art/Mikerphone collaboration Barrel-Aged Hazelnut Stout. We sit down with Isaac Showaki from Octopi and Levi Funk from the Funk Factory Geuzeria, as well as special guests Danny and Jonny from TheFullPint.com, for a live tasting and a discussion about the making of a collab beer and all of the shenanigans that can occur during the process. Grab a pint of your favorite Special Release Beer and join us! Cheers!